With its performance and versatility is perfectly suited to home cinema systems, multiroom and sonorization. 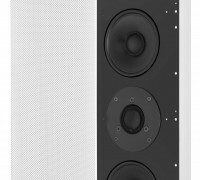 By popular demand we created specifical home cinema speakers for discerning ears that do not compromise in quality, power and sound pressure. The power of 300 W RMS makes these home theater speakers a milestone of Garvan production . Combining quality craftsmanship and design, Garvan created the line of bookshelf speakers with the same speakers of the flat speakers collection . The compact size, clean lines, the unmistakable Garvan technology and the wide range of customizations create a magical harmony between form, function and technology. The speaker is secured with powerful neodymium magnets that provide the ability to fit perfectly flush with the cabinet. Garvan, thanks to the practical mounting system of the aesthetic cover and the wide possibilities to customize the speakers, creates solutions for every need. 100% Made in Italy Loudspeakers. Quality of the Italian handicraft: accuracy on the production and creation in every single loudspeaker with the release of a specific guarantee of authenticity.